A change in time zone can affect your sleep, leading to court fatigue and maybe even injury. If you can, arrive at least a day (preferably a few days) prior to being on the court to adjust to the new time zone. If you are unable to arrive early, try to adjust your sleeping pattern at home, before you go. Check the Weather app to see what the temperature and humidity will be at your tennis destination, and then try to prepare for the climate ahead of time. For example, if you’re traveling from a cold climate to a warm one, increase your hydration at least one week prior to your trip. It will really make a difference in your game. Believe it or not, altitude is a big factor when playing tennis, especially when playing outdoors. A higher altitude may cause dehydration and fatigue, so allow some time to properly acclimate. As with weather conditions, you’ll want to increase your fluid intake at least one week prior to your trip. 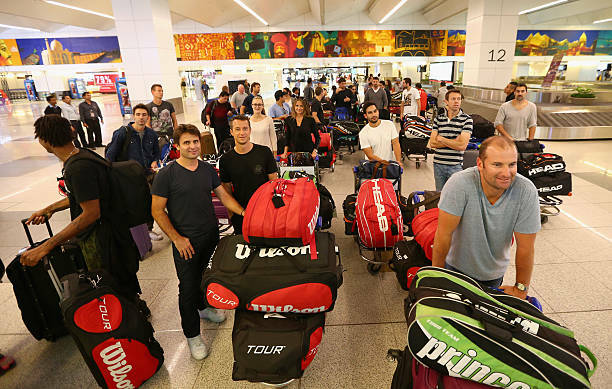 The time to look through all of your tennis gear and make sure it’s in good condition is not the night before you leave on your trip. Why? Because if you do this, as I did last week, you’ll find your racket needs re-stringing but you don’t have time to get it re-strung before you go out of town. Don’t be like me. Be sure and check your rackets and have them re-strung at least a week in advance. And make sure you pack your tennis apparel, socks and tennis shoes, and any other gear you may need: extra racket (in case you break a string), overgrip, an extra dampener, water bottle, dry grip or rosin bag, towels, hats, visors, sunglasses, sunscreen (if driving or checking your bag), and anything else you like to have handy. You may be traveling somewhere you won’t have access to any of these things, so be sure and bring them along. In my past tennis travels, I packed my rackets in suitcases, but now I prefer to carry them on in my tennis bag. I know right where they are at all times, and there is very little chance that they will get damaged. The TSA allows rackets on planes, as long as your tennis bag (or other carry-on bag) meets the size requirements for overhead bins. If traveling internationally, as this happened to a friend of mine on her way out of Qatar, always check to see what they consider "weapons." Her racket was taken from her at security and checked at the last minute in a plastic bag. But try and carry your racket when you can, as it’s always fun to see a fellow player onboard. Should you decide to pack them in a suitcase, however, I recommend you add some clothes to the suitcase, then your racket(s), and then the rest of your clothes so they are protected from damage by being thrown around by airline employees (you know they do it). One last thing about protecting your rackets while they’re in transit – if you’re going to be in a car, be sure you don’t leave them in your car for any extended period of time, especially if you’re experiencing extreme weather. The inside of a car can get brutally hot or icy cold depending on the temperature, and you don’t want your rackets to be negatively affected by temperature swings. So be sure and bring your racket(s) inside when you arrive at your destination. When flying, I always use my tennis bag as my carry-on bag. I have a backpack bag, which is great, because not only is the weight of it is more evenly distributed across my back and shoulders when I’m carrying it through the airport, but my racket handles stick out of the top of it, so I’m less likely to whack anybody in the head when boarding the plane. One thing to note is that when using your tennis bag as a carry-on, you need to be sure you clean it out. Get rid of the old tennis balls, team rosters, extra towels, 7 pens, and 2 notebooks that you usually carry around for league play. In my opinion, you should always have two tennis rackets (if you have them) with you because you never know if you’ll break a string or crack a frame, or have some other racket disaster. This is especially important if you’re traveling for a tournament. While it doesn’t matter if you’re playing for fun and need to borrow someone’s extra racket, but it really counts when you’re playing in a tournament and want to win. You want to make sure you have your racket, the racket you’re used to. I think it best to not have any tennis on the day following your return from a tennis trip. I’ve done it before, and it ended up not going as well as I thought it would. I still hadn’t gotten over my jet lag, and my feet were still a little sore from all the of the tourist-y walking around we had done. What I should have done was chillax, maybe do some light stretching, and massage my aching soles with a tennis ball. Be sure and visit Tennis Life Magazine for great tennis tips, athlete-specific nutrition tips and recipes, health and wellness articles, tennis-specific fitness videos, and much more!